After Lancia handed over its D50 project to Ferrari, the car underwent a series of innovative improvements to become a star racer in the 1956 Grand Prix season. In France, Peter Collins drove his Ferrari D50 to win a second Grand Prix victory over Eugenio Castellotti and Jean Behra. Following a hiatus in the wake of the tragic Le Mans accident, the Grand Prix de France resumed in 1956. As the fifth round of the World Championship, it took place on July 1 at the “Circuit de Reims-Gueux”. The race consisted of 61 laps, each of 8.302 km, totaling 506.4 km. 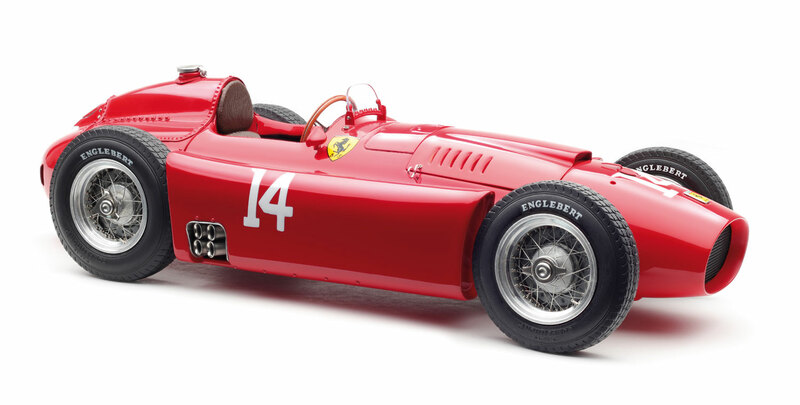 Scuderia Ferrari fielded a lineup with Juan Manuel Fangio, Eugenio Castellotti and Peter Collins primarily. The other two spots were filled by the Spaniard Alfonso de Portago, who was going to start his first Formula 1 race, and Olivier Gendebien. All of them were to race in a 265-hp short-nose Ferrari D50. Maserati had Stirling Moss, Jean Behra and Piero Taruffi on its team, each piloting a 250F. Among the other opponents were the British team Vandervell Products Ltd with its Vanwall VW56 fleet and the French team Gordini with its Type 32 and Type 16. There were also several privateers aspiring to compete in self-owned Maserati 250F‘s. During the qualifying practice, it became apparent that the Maserati 250F could hardly keep up with the pace of the Ferrari D50, whereas the cars of Vanwall proved more capable. Fangio won pole position ahead of his teammates Castellotti and Collins. In the drivers’ standings, however, Collins and Moss had broken even to lead Behra and Fangio. Once the race started, Collins took the lead, and together, the Ferrari trio distanced themselves from the followers. Moss dueled with Schell from the Vanwall team for the fourth place. Their grueling contest was interrupted first by an engine failure that Schell suffered and then by a damaged gearbox that happened to Moss. Both drivers, however, resumed racing in the cars of their teammates. Having advanced to the fourth place, Schell started chasing Castellotti and Collins and eventually overtook them. He was in second place behind Fangio for six laps. When Collins and Castellotti realized that the Britt was not one lap behind them, they accelerated hard to surpass him. In the heat of competition, Schell was compelled to make a pit-stop with technical problems. At the same time, technical problems also forced Fangio to go to the pit, which reduced him to a 4th-place finish eventually. Peter Collins won his second Grand Prix victory by finishing 0.3 seconds ahead of his team-mate Eugenio Castellotti.